ISA Certification is a voluntary effort among professionals in the tree care industry to establish a standard of quality in arboricultural work, promote and encourage continuing education, and provide the public with a mechanism for identifying qualified ISA Certified Arborists. ISA Certified Arborists have a competitive advantage over arborists who are not certified. With an ISA Certification, you can advertise all of the knowledge and experience gained during your green industry career. Your ISA Certification tells potential clients and employers you can be trusted with their trees. The work you put into earning and maintaining your certification reflects your commitment to high standards of tree care. An ISA Certification will also help you stay up to date on the latest advances in the industry and keep in touch with the arboriculture community at large. Maintaining your certification means earning ISA Continuing Education Units (CEUs) by taking classes or reading educational publications. An ISA Certified Arborist is a professional dedicated to lifelong learning. ISA Certification provides higher levels of achievement to aspire to in your career. The highest level of certification, ISA Board Certified Master Arborist, rewards those have reached the pinnacle of their profession. 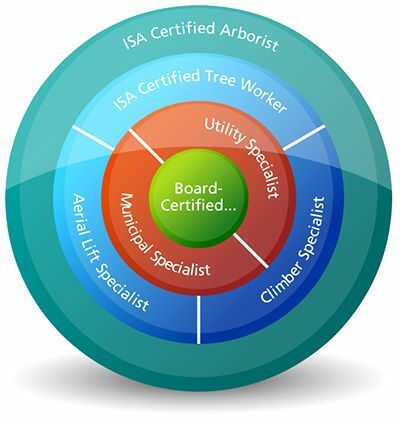 By becoming ISA Certified, you support high technical standards in the tree care industry. The ISA Certification Code of Ethics strengthens the credibility and reliability of the work force. These rigorous standards reassure potential clients and employers that hiring an ISA Certified Arborist is a solid investment. ISA Certification provides a standardized method of judging career level and expertise that allows for smarting hiring by employers and career growth for tree care workers. These benchmarks are supported and maintained by professionals dedicated to the health of their industry.